Order a Color Swatch Earring Type: Choose an OptionPiercedClip On Necklace Length: Choose an Option16"18"
One of our most popular jewelry sets! 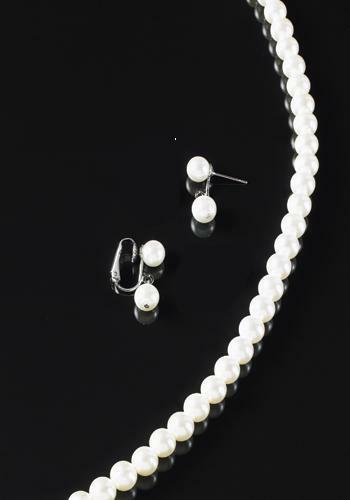 Pearls are timeless and add a simple beauty to any gown. Dress up any outfit with either of our 8mm clip-on or pierced earrings. The 8mm stud has another 8mm stud that dangles below. Necklace in available in your choice of 16 inch or 18 inch lengths. FWO Extras: Set includes both the pearl earrings and the pearl necklace.